When I'd just moved to London in 2010, not a month went by without me visiting the National Theatre, but with an increasingly busy social and work life (not to mention an entire city of theatres to explore) I don't go to the NT as often anymore as I'd like. So when I do get a chance to pop by my favourite haunt on the South Bank, it's always feels like a treat. The most recent productions I've reviewed there were the excellent Jane Eyre and Three Days in the Country, but since those were over a year ago already, needless to say a visit was long overdue. And I couldn't have had a more memorable reunion with the NT than with the spectacular and riveting Amadeus. Amadeus tells the tale of the supposed rivalry between classic composer Antonio Salieri and child prodigy Wolfgang Amadeus Mozart when they were both working in Vienna towards the end of the 18th century. Their strained relationship is recounted by an elderly, dying Salieri and paints a very subjective picture of the younger, more talented but also far more flamboyant Mozart who can only be described as an annoying brat who never grew up. And yet, as the years go by, Salieri doesn't remain an innocent bystander in the chaos that goes down in Vienna either, and ultimately feels responsible for Mozart's untimely death at the age of just 35. Written by Sir Peter Schaffer, who sadly passed away earlier this year and so didn't see this latest adaptation come to life on stage, this production sees Schaffer's most successful play return to the place where it was originated in 1979: the Olivier Theatre. It has had many incarnations since, including a stint on Broadway and a film adaptation that won an incredible eight Oscars, yet despite being such an established story for many decades this was actually the first time I had the pleasure to see it. I went in with little expectation beyond watching a feud between two famous composers, and so I was completely blown away by the story that unfolded on stage. It was absorbing and epic and, while a scandalous and fictionalised account of real historical figures, also immensely insightful. And despite being over three hours in length (including the interval) the play never felt like it outstayed its welcome. Rather, it was constantly fast-paced and accessible. That isn't to say that Amadeus is perfect. The strange co-existence of contemporary British and traditional 18th century Austrian elements within this production (I don't know whether this is something all adaptations incorporate) didn't work for me, and Mozart's childish behaviour in the first half felt outrageously excessive and irritating, and didn't suit the overall tone of the play. And yet... I cannot remember the last time I've been so absolutely riveted by a piece of theatre – it's been at least a few years. I was completely emotionally engaged throughout the second half and it made me rethink everything that had happened in the first. Mozart, a character I despised in Act 1 had become one I fell for completely after the interval, which is a testimony to Adam Gillen's engrossing performance. And Salieri's own journey onto a much darker path in Act 2, portrayed so exquisitely by the charismatic Lucian Msamati, too added layer of richness, making this one of the rare occasions where the second half triumphed over the first. Amadeus is an epic theatrical spectacle; Salieri's monologues were inspiring, the costume design was stunning, musically it was constantly exciting with the 20-piece Southbank Sinfonia on stage as part of the action, and Mozart's slow descent into madness was both captivating and surprisingly moving. In short, this is a must-see production. And if London is too far away for you to check it out, do not despair. 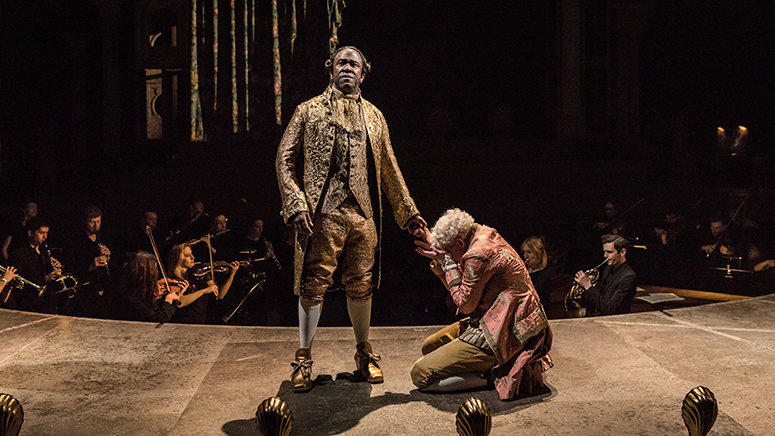 Amadeus is being broadcast live to cinemas on 2 February 2017 to over 680 screens in the UK as part of the excellent NT Live, so check your local listings on www.ntlive.com. Amadeus is playing at the National Theatre in London until 2 February 2017. You can book your tickets here. Many thanks to Theatre Bloggers for the invite to review the play!